Even when I am between my trips to the US (like at the moment) I still can’t completely abandon my American passion. That’s when reading and researching comes handy. 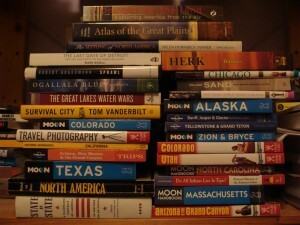 So I decided to share some of the interesting books about America which I have read in the last few years. Let’s start with some classics. I have to admit that it was only recently that I decided to read two of the most important American books: “The Grapes of Wrath” by John Steinbeck and “On the Road” by Jack Kerouac. Steinbeck’s novel especially made a big impression on me. I’m not really a big novel reader but this is an excellent book. Steinbeck’s description of the great depression and corresponding poverty is very vivid. It is definitely one of the best books I have ever read. It also feels relevant in our contemporary economic crisis. Sometimes when I watch the news or documentaries about poverty I think that times haven’t changed that much since the 1920s. On the Road is a much more optimistic book, a classic travel story set in the late 1940s. It is one of the defining works of the Beat Generation with its protagonists living a life against a backdrop of jazz, poetry, and drug use. One of the best anthologies I have read was “State by State: A Panoramic Portrait of America”. It is a collection of essays, one on each of the fifty states, which must have been inspired by the legendary WPA American Guide series of the 1930s and ’40s. Authors of the essays vary from well-known novelists and journalists (think Anthony Bourdain, Susan Orlean, and Sarah Vowell) to not so well-known, but they are all worth a read. Stories in the book are really diverse, two of the chapters (not surprisingly on cool Oregon and Vermont) are even in the form of short graphic novels. But it is non-fiction which I really enjoy and one of my favourite subjects is history. Over the years I have read many publications about American history. 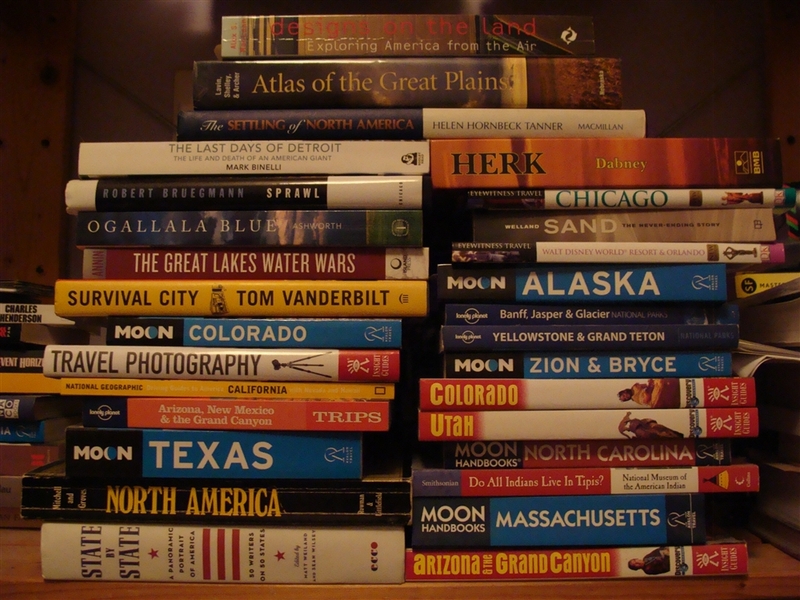 Some of them were thin and light booklets, some were standard books and some of them were complete and detailed multi-volume works (including a five-volume history of the USA published in Polish). I don’t remember the titles and authors of all of them but here are some of a few of my recent favourites. Let’s start with “Colonial America: A History, 1607-1760” by Richard Middleton. This is a single-volume narrative history of the 13 North American British colonies which eventually formed the nucleus of the United States. The author covers the entire period from foundation and the first settlement of the Pilgrim Fathers to the start of the movement for independence. I really enjoy such precise and geeky books. For the same reason I also really enjoyed “1776: America and Britain at War” by David McCullough. This detailed yet colourful book presents the story of the year of the birth of the United States of America. It tells two stories: how a group of squabbling, disparate colonies became the United States, and how the British Empire tried to stop them. It features a cast of amazing characters from George III to George Washington, to soldiers and their families. However, I have to warn you about two things: it only cover year 1776, not the whole war for independence, and it helps if you already know a bit about US history when you read it. Anyone even remotely interested in American history should read something about the American Civil War. This was a defining moment in American history as well as its bloodiest war and it accounted for roughly as many American deaths (about 620,000) as all American deaths in other U.S. wars combined. A good book to start with is “The American Civil” War from the excelent Essential Histories series produced by Osprey Publishing. This book, with a foreword by Professor James McPherson, traces the course of the war in both Eastern and Western theatres, looking at strategic, geographical and logistic factors as well as the soldiers, officers, and civilians who were caught up in the conflict. Another book which I simply have to list here is Simon’s Schama “The American Future”. It traces the history of a country whose most enduring trait is its capacity for self-renewal, especially in times of disaster. Examining issues of power, race and immigration, religious fervour and prosperity, this masterful portrait of the world’s most controversial superpower looks backwards and forwards to understand why now, more than ever, the fate of America, and by extension the rest of the world, is hanging in the balance. An assessment of America’s past at a time of apparent radical change – the 2008 presidential election – is the prism through which Schama’s narrative works (the result was not yet known when the book was published) and lies behind the book’s title. Finally, one more interesting book about American history which I want to mention is “The American West: A New Interpretive History” by Robert V. Hine and John Mack Faragher. They present the American West as both frontier and region, real and imagined, old and new, and they show how men and women of all ethnic groups were affected when different cultures met and clashed. Their concise and engaging survey of frontier history traces the story from the first Columbian contacts between Native Americans and Europeans to the multicultural encounters of the modern Southwest. It is great book, but in my opinion it lacks a bit of balance At times the authors summarize crudely-with dismissive judgements (“nonsense”) and use exclamation points galore to show us when we should boo or hiss. Less empowered (victim) groups are too often uncritically treated as noble and the majority as vile even though the book pays little attention to the latter. Still, even with those few drawbacks, it is still well worth reading. As much as I like history, it is not everything. At the end, I am still a geographer, both in my heart and by profession and I always enjoy books which have some “geographic angle” to them. There are quite a few of them so I will have to write about them next time. This entry was posted in Uncategorized and tagged america, books, history, novel on May 28, 2013 by admin.